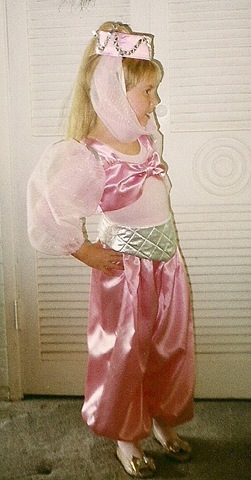 Back in the day, when littlepeach#1 was the only little peach in our lives, I was one of those moms that went overboard making the halloween costume each year. By the time littlepeach#2 rolled along I was SO over that. Looking back though, those were some great costumes. 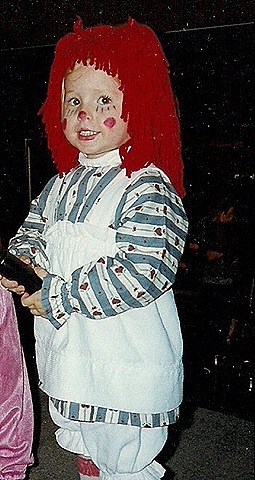 She was a cute Raggedy Ann. They aren't showing but I took white tights and with a red marker made horizontal stripes. I can't remember but that must have taken me a long time, I was nuts back then. Remember Xena – Warrior Princess? We were big fans of that show and this was a fun costume to create. I used black vinyl and a lot of gold fabric paint. I Dream of Jeannie. Hands down, this was my favorite! I made this to go over a pink leotard. I created the pill box hat by covering cardboard and sewing it together and then adding a blonde ponytail coming out of the top. I think I convinced her to wear this one two years in a row because I loved it so much. Littlepeach#1 is off to college now. She has to make her own costume this year. I didn’t have girls or I would have been doing this every year. I made one costume for my oldest boy(he was 4yrs old) and then, after all the hard work, he didn’t want to wear it. That was the last time I “made” a costume. These are very cute pictures. I always wanted to be Jeanie, Never had the blond hair or costume to pull it off. She was so lucky and didn’t know it then. Might not know it now either, but when she has to make a Halloween costume she’ll appreciate it and you. Not only are you an amazing costume maker, but your wreaths are breath taking. Wish list forever! oh my GOSH! My little girl was Raggedy Ann and I painted the stripes on her white tights! She had the wig and everything…then the next year she was a Jeanie! I used gold lame and it was horrible to sew on! They must be about the same age! By the time kid number three came along all creative costuming was OVER! What great costumes and MEMORIES you made! I too would go overboard making costumes…now my kids are 11 and 13 and like to create their own. Your little Georgia Peachez are adorable in their Halloween Costumes! Raggedy Ann was my daughter’s favorite, too! Very impressed by the costumes. I was never that creative when I was little. What will you be this Halloween?